Read why Bwedd.com wedding websites are the best! 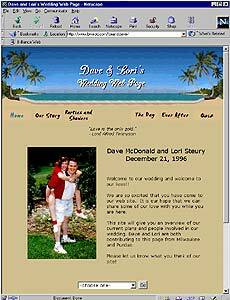 Dave and Lori's actual wedding website. ...Wasn't it just yesterday when it seemed like this day would never come? Now, all that stands between you and your future is this quickly-shrinking bridge to marriage. Did you know you could be so happy?